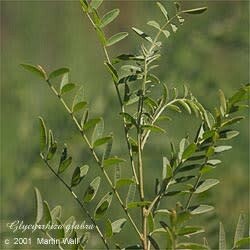 The genus name Glycyrrhiza derives from the Greek glyky ryhiza, "sweet root," as does the common name licorice. Glabra, the species name, is Latin for "smooth," in reference to the smooth seedpods. There are about twenty species of licorice native to Eurasia, Australia, and North and South America. These perennial herbs or small shrubs have alternate, oddly pinnate leaves. Many of the species have sticky hairs. The small whitish, yellow, or purplish pea-like flowers grow in spikes or racemes from the leaf axils. Licorice is often found in the wild in grassy areas with salty, alkaline soil. It prefers full sun to partial shade, moderate amounts of water, and well-drained or sandy soil. It fixes nitrogen and can be cultivated and turned into the soil to enrich it. Licorice is one of the most commonly used herbs in traditional Chinese medicine. It enters all twelve meridians and harmonizes the effects of other herbs, helping to prolong their effects. Licorice clears heat and encourages the movement of leukocytes toward areas of inflammation. Its constituent glycyrrhizin (which is similar to the human hormone cortisol) inhibits the production of the inflammatory prostaglandin E2. Licorice stimulates interferon production, soothes irritated mucous membranes, restores pituitary activity, and helps normalize the function of glands and organs. It also helps induce feelings of calmness, peace, and harmony. Licorice is used in the treatment of acid indigestion, Addison's disease, adrenal weakness, age spots, AIDS, alcoholism, allergies, arthritis, I1asthma, bladder infection, bronchitis, bursitis, cancer, candida, carbuncles, catarrh, chronic fatigue, cirrhosis, colds, constipation, cough (dry), debility, depression, diarrhea, dry cough, dropsy, dyspnea, dysuria, eczema, Epstein-Barr virus, emotional instability, emphysema, fatigue, fever, gallbladder inflammation, gastritis, gout, Grave's disease, hair loss, hay fever, heartburn, hemorrhoids, hepatitis, herpes, HIV, hives, hoarseness, hypoglycemia, hysteria, immune system weakness, infertility (male and female), irregular ovulation, irritability, irritable bowel, laryngitis, Lyme disease, menstrual cramps, Parkinson's disease, pharyngitis, poisoning (from food or chemicals), prostatitis, psoriasis, shortness of breath, sore throat, stomachache, stress, tendonitis, thirst, tuberculosis, tumors, ulcers, underweight conditions, and wheezing. In hair rinses, it can help prevent hair loss and dandruff. It also can be used as a lubricating enema or douche. Licorice is used in lotions and salves for inflamed eyelids and dry eyes, eczema, psoriasis, shingles, and wounds. It is included in mouthwashes for tooth decay prevention, gingivitis, and mouth sores. It can be used as a wash for itchy skin, and rashes. It is found in hair rinses for hair loss and dandruff. Also used as a lubricating enema or douche. Licorice root contains glycyrrhizin, which is fifty times sweeter than sugar, and as a result licorice is a common sweetener, one that can be safely consumed even by most diabetics. However, most licorice candies contain essential oil of anise or synthetic flavorings and not licorice, so don't depend on "licorice" bonbons for therapeutic value. Licorice has a sweet, woody flavor and is an excellent thirst quencher. It is often added to other herbs and medicines to improve their flavor. Ninety percent of the licorice imported into the United States is used to flavor tobacco. Licorice can also be used to make a fabric dye. Avoid licorice in cases of edema, nausea, vomiting, and rapid heartbeat. Licorice is not recommended during pregnancy or in combination with steroid or digoxin medications. Large doses may cause sodium retention and potassium depletion and may be emetic. Prolonged or excessive use may elevate blood pressure and cause headache and vertigo. Continuous use is not recommended in excess of six weeks, except under the guidance of a qualified health-care practitioner. Chinese licorice (G. uralensis) is said to be less likely to cause side effects than the European variety (G. glabra). All these precautions notwithstanding, licorice is often added in very small amounts to other herbal formulas to harmonize them and prevent undesirable side effects.